This book is packed with all kinds of goodness, and if you like oatmeal and overnight oats, this book is definitely for you – Banana Pudding, Cinnamon Roll, Protein Packed Peanut Butter Cup are just a few of the many Overnight Oats recipes. If you prefer warm oats, Kathy included Hummingbird Cake Oatmeal, Lemon Raspberry Cheesecake Oatmeal, and Baked Meyer Lemon Steel-Cut Oatmeal. Everything sounds so good, but that Meyer Lemon is calling my name. That’s next for me. 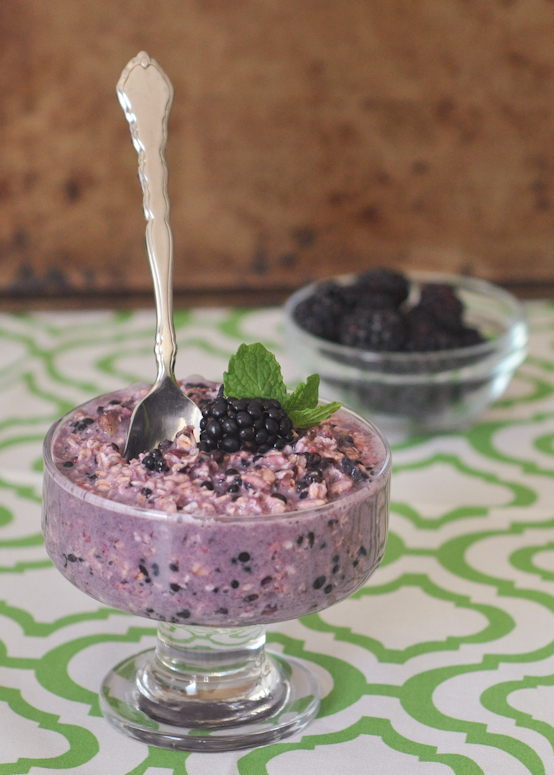 Being a fan of oatmeal in the morning, I chose to share Kathy’s Blackberry Mojito Overnight Oats. I made this for Jason and I the day before we got married last week, and it fueled our busy day in a tasty way. I love the tart bite of lime, and the just sweet enough flavor from the blackberries. I did add the chia seeds, which was a great addition for extra protein, nutrients, and fiber. sweet juicy blackberries soaked in bright lime and mint flavors with the faintest aroma of rum will perk you up even on the toughest mornings. 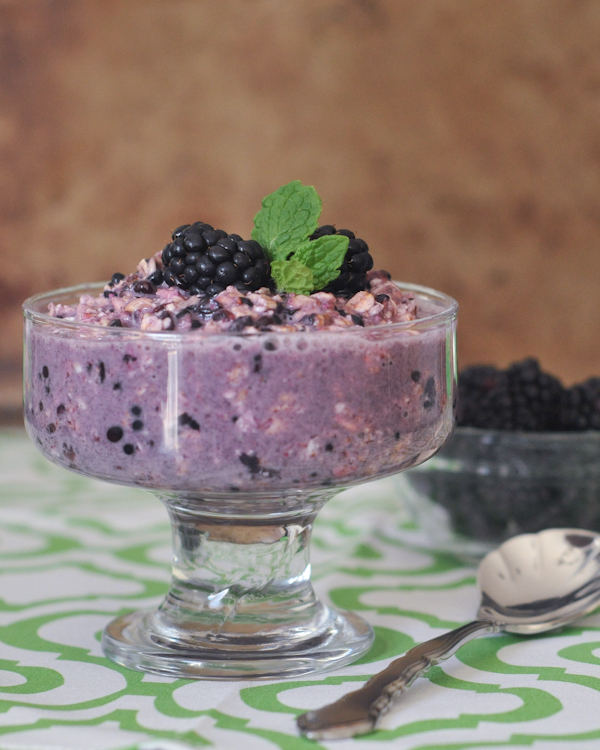 You can add a teaspoon or two of chia seeds to make this extra thick. Add all the ingredients in a mason jar or a dish with a cover. Mix well and let sit in the fridge overnight. Stir and eat. I would love this book! I have always wanted to try mixing up my breakfasts. The color of this is fab! Wow, a whole book about oats? That sounds wonderful. I love oats but can never think of much to do with them. This recipe is SO pretty. That color is just lovely. Thanks for sharing! wow – this sounds so good! I wouldn’t have ever thought of this combo. 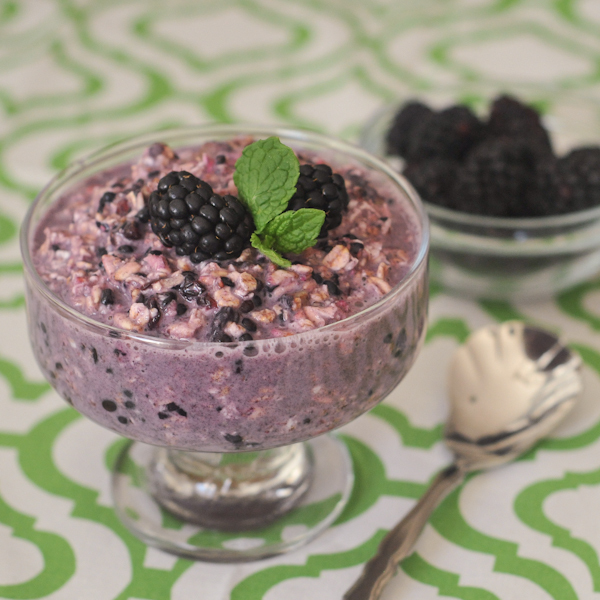 I still haven’t tried the overnight oats phenomena, but this recipe might compel me into action! Rum is never optional. Especially before noon. LOL! Thank you so much for being on the tour. I love your photo! !